Stretching is an excellent thing you can do for your health. These simple, yet effective moves can help you limber up for sports, improve your balance and prevent falls, increase your flexibility, and even help relieve arthritis, back, and knee pain. 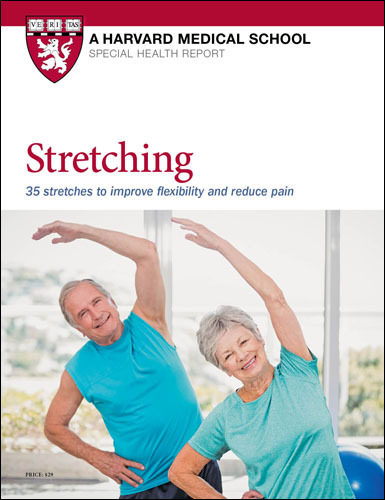 Whether you're an armchair athlete or a sports enthusiast, this Special Health Report, Stretching: 35 exercises to improve flexibility and reduce pain, from the experts at Harvard Medical School will show you how to create effective stretching routines that meet your needs and ability. Stretching is an excellent thing you can do for your health. These simple, yet effective moves can help you limber up for sports, improve your balance and prevent falls, increase your flexibility, and even help relieve arthritis, back, and knee pain. Whether you’re an armchair athlete or a sports enthusiast, this Special Health Report from the experts at Harvard Medical School will show you how to create effective stretching routines that meet your needs and ability. FREE access to our online stretching exercises with master trainer Josie Gardiner. Charts that detail which stretches are best for a variety of sports, from golf to tennis to walking or skiing. Special warm-up routine section with dynamic stretches that help you loosen up joints and increase your range of motion. Stretching: 35 exercises to improve flexibility and reduce pain, will tell you the best time of day to stretch if you have arthritis and why you should beware the popular stretch that can actually injure muscles. You'll discover how to loosen up the three muscles that could cause knee pain. There's even help for desk jockeys, who will find the right stretches to help ease neck and shoulder pain. How often—and how much—should you stretch? Before launching into a new activity, it’s common to have some questions. Below are answers to six frequently asked questions about stretching. 1. How often do I need to stretch? 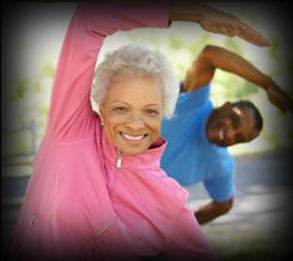 As with all types of exercise, you need to engage in stretching regularly in order to reap lasting benefits. If you only stretch occasionally, the effects are shortlived. One study found that the greatest increase in hamstring length occurred right after the stretch and began to diminish within 15 seconds, though there was a noticeable effect for up to 24 hours. A daily regimen will deliver the greatest gains, but typically, you can expect lasting improvement in flexibility if you stretch at least two or three times a week. 2. How long do I need to hold a static stretch? Although opinion varies on this, the ACSM recommends holding a static stretch for 10 to 30 seconds. Research suggests the biggest change in muscle length takes place between 15 and 30 seconds. How long you hold a static stretch helps dictate how many repetitions (reps) of the stretch you should do. The ACSM says 60 seconds of cumulative time per static stretch is optimal and recommends doing two to four reps to achieve this total time. So, if you can hold a particular stretch for 15 seconds, repeat it three more times. If you can hold the stretch for 30 seconds, one more rep would suffice. 3. Will stretching ward off or ease muscle soreness after exercise or sports? Can stretching help reduce this soreness? A review of studies found that those who engaged in post-exercise stretching rated their discomfort a day after exercise at half a point lower, on average, on a 100-point scale than those who hadn’t stretched. A large-scale study in the review showed an average four-point dip in soreness over one week for those who stretched before or after exercise. All in all, not a difference most of us would notice.